Recently, the Center for Disease Control (CDC) finally admitted that a known cancer-causing virus known as SV40 (Simian Virus 40) was added to polio vaccines given to some 98 million Americans from 1955-1963. 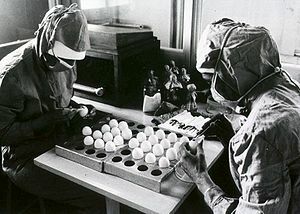 It is now estimated that anywhere from 10-30 million people were given the SV40 tainted Salk and Sabin polio vaccines. Once this story started to gain traction, though, the CDC promptly removed it. However, the story has been cached on their website and can be found here. Having worked extensively in the vaccine development departments of companies such as Merck Pharmaceuticals, Dr. Maurice Hilleman, openly admitted on a censored news broadcast that SV40 was imported from green rhesus monkeys from Africa and led to the beginnings of what would later become the AIDS pandemic. Many people may also be familiar with the research of Dr. Len Horowitz, who was able to document the origins of the AIDS virus in his seminal book Emerging Viruses: AIDS and Ebola. He in turn was able to add his own take on the classic underground video on the subject known as the Strecker Memorandum, which outlined how the AIDS virus was both created in a laboratory and subsequently spread through vaccine trials conducted in the 1970s. These vaccine trials were administered by the World Health Organization (WHO) on the population of Africa beginning in the Republic of Congo and by the Center for Disease Control (CDC) on “gay” men in New York City and San Francisco from 1972-1974, which of course ballooned in the AIDS epidemic of the 1980s. According to Joseph P. Farrell in Reich of the Black Sun, Merck Pharmaceuticals received a huge endowment of cash and gold from the Third Reich’s 2nd in Command, Martin Bormann, prior to the Nazi hierarchy’s mass exodus via the “ratlines” out of Germany at the end of WWII. The main reason for giving this money to Merck, along with some 750 companies, was to gain complete control over the pharmaceutical/chemical industries. The surviving Nazis could then use them to support Nazi para-military and criminal activities abroad as well as support their eugenics/depopulation agenda alongside the Rockefeller foundation. Of course, it isn’t just the AIDS virus spread using Hepatitis B vaccines or tumor-creating SV40 viruses spread through the early polio vaccines that wreck such havoc on our health and immune systems. Remember the Swine Flu (H1N1) that they were blaming on some dead pigs in Mexico and claimed had infected a handful of people in the US that the CDC was hyping to push major vaccine inoculations? Having passed the Model State Emergency Health Powers Act in 2001 after the Anthrax scare, it was thought that the government could have made taking the Swine Flu vaccine mandatory or else you might very well find yourself under FEMA camp quarantine. Turns out they tried the same thing back in 1976 and Mike Wallace actually reported on what an unmitigated disaster the vaccine campaign was in a episode of 60 Minutes that only aired once. In fact, the government ended up having to pull the vaccine from being administered, since the vaccine was crippling far more people with Guillain-Barre Syndrome (GBS) than those coming down with swine influenza. Lately, children are being given a veritable cocktail of toxic substances (formaldehyde, MSG, aluminum hydroxide, live viruses, etc.) injected into their arms from the time that they’re born all throughout grade school, when their immune systems are particularly fragile to this kind of bio-chemical assault. Of course, when doctors dare question the sanity and science of vaccines like Dr. Andrew Wakefield did with an article published in the British medical journal Lancet over the probable link between autism and mercury adjuncts (thimerosal) found in the MMR vaccine, they get eviscerated by the mainstream “big pharma supported” press, kangaroo courts presided over by biased medical review boards, government stooges at the CDC, and academics that receive millions of dollars in research grants from pharmaceutical companies. Indeed, it is these very same pharmaceutical companies that I call the medical mafia like Merck, Eli Lilly, Novartis, Baxter, Glaxo-Smith Kline, and Bayer, who make a killing (both literally and monetarily) from the often crippling and sometimes lethal effects of vaccines.